iCivics is a non-profit organization dedicated to reinvigorating civic learning through interactive and engaging learning resources. Their platform has more than 7 million registered students and 100,000 registered teachers in all 50 United States. The article below is written by iCivics Director of Content Carrie Ray-Hill and shares valuable insights into creating mission-driven game-based learning tools. 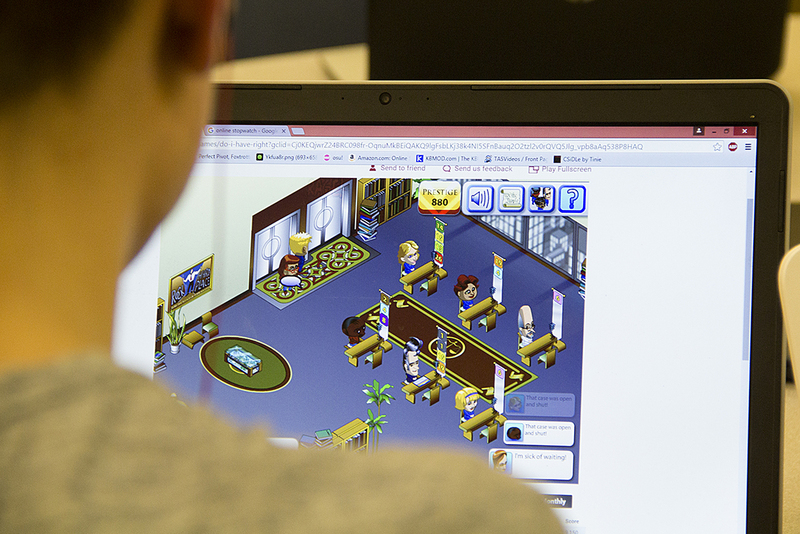 So you want to enter the magical world of game-based learning? Good! It only takes a few minutes on the app stores to see that not all learning games are equal. Just because you have a game and that game has some educational elements does not mean it will make an impact on the players- be they students, employees, or the general public. And why would you want to invest time, money, and branding on a game that looks good but fails to deliver on your larger goals? Impact in game-based learning involves successful incorporation of your learning objectives, design and platform choices that engage the player in a way that lingers, and the extent to which your game can be used as a part of a larger educational effort or campaign. It’s a lot, but it’s important. And if any one of these three elements are missing, the game will fail to deliver. 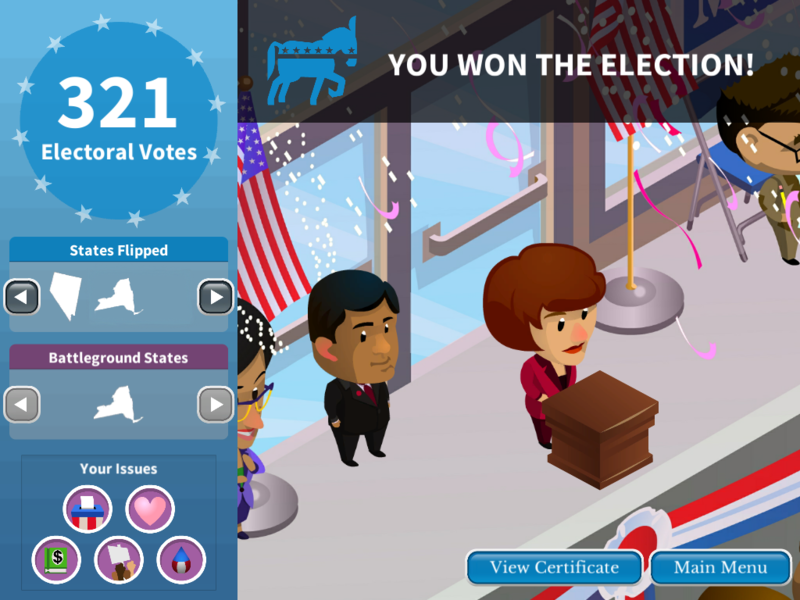 iCivics has published 19 games with Filament Games over the last seven years, learning more about how to draw out the greatest impact with each title. After a lot of coffee, a little inspiration, and a good bit of reflection, I’ve boiled down what we’ve learned about making games that have impact. My examples will be drawn from developing games for the middle and high school classroom, but you can easily apply these to other arenas. What learning objectives and/or standards do you need to communicate to the player? Focusing on the standards keep our content and game teams’ eyes on the learning. There is always room for fanciful elements, but they need to serve the learning to be worth the cost and time. Warning- do NOT kitchen sink your set of learning objectives. Pick out which 2-3 are most critical and make sure they lend themselves to a game-based experience. Prioritize elements that are hard to get across to learners with more traditional methods. Win the White House focused on the electoral campaign system of media, momentum, and fundraising because it is challenging to show how these elements interact on paper or whiteboard. How well do learning objectives translate into game play? Challenges and rewards should make sense and seem natural in the game space. The play should allow for contextual learning- not provide skill and drill instruction. (Quiz games are so 2008.) You also need to consider how you will collect and show data to represent learning. Instant and applicable feedback is a big reason learning games work. Simple points scored at the end of the game fail to represent the complexity of what actually happens during play. 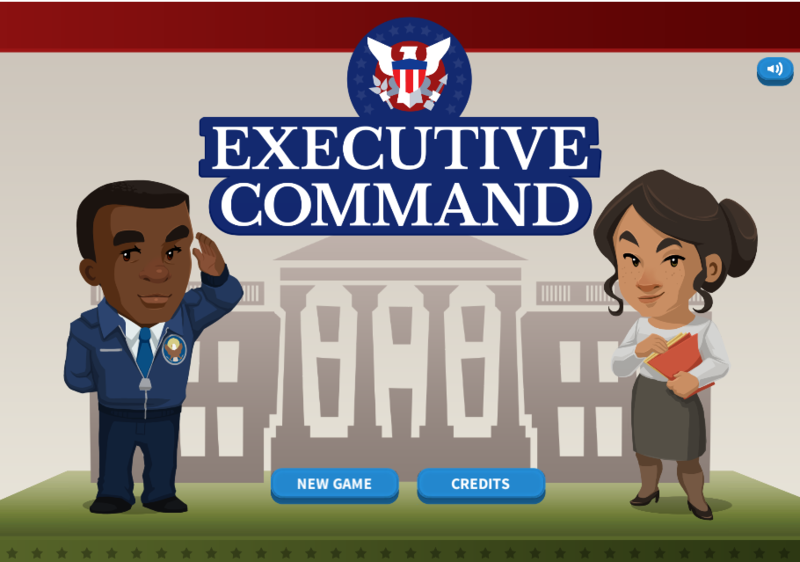 Executive Command uses news flashes and a Chief of Staff character to give the player feedback, and thoughtful play is rewarded through boosts to your public approval rating and agenda support in Congress. Both relevant aspects of being the president! How does the game fit into a real classroom/training/visitor experience? Consider the length of play, complexity of instructions, need for external facilitation, and technology needed against what is really in place. A 30-minute game won’t work in a museum where people are on the move. A game that requires one-to-one technology may not work in a classroom with two old computers in the back of the room. Also seriously consider the value-add of support materials for anyone tasked with introducing or facilitating the game with players. 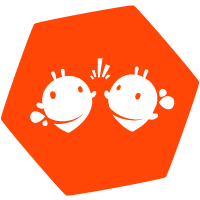 iCivics Platform: We design our games for middle to high school classrooms, which means they shouldn’t take longer than 35 minutes; save progress of play; and are flexible for one-to-one, pair play, and one-to-many technology settings. We also give teachers Game Guides and Extension Packs to keep up the momentum of learning. Is it fun? Will they keep playing? If you can strike the right balance between engaging game play elements, learning objectives, and content that is efficient and entertaining you might just catch a smile on that 13 year old when she thinks that no one is looking. iCivics doesn’t try to compete with the graphics and production levels of AAA games, and we’ve found that we don’t have to. Our games inspire persistence in play and offer replayability through interesting paths and content. When a student emails you stating that he got into some hot water with his parents after being found playing video games after bedtime… and that game was one of ours introduced to him by his teacher, you start to think you are onto something! Willing players translate to willing learners. I will throw an extra “P” onto this list, free of charge. And that is Partnership. We have found great success in our long and productive partnership with Filament Games. The vendor/client relationship can be very uptight and formal, but for us it’s been a matter of growing and learning with each project and product launch. There is a lot of give and take, collaboration in the truest sense of the word, and keeping our eyes on the goal of simply making amazing play experiences for our students. As you dip a toe into the world of game-based learning, try to find partners that share you and your organization’s values and work ethic–ones that want to help you build on your mission, and realize your goals. That’s where the fun (and success) in this business can be found. Good luck! 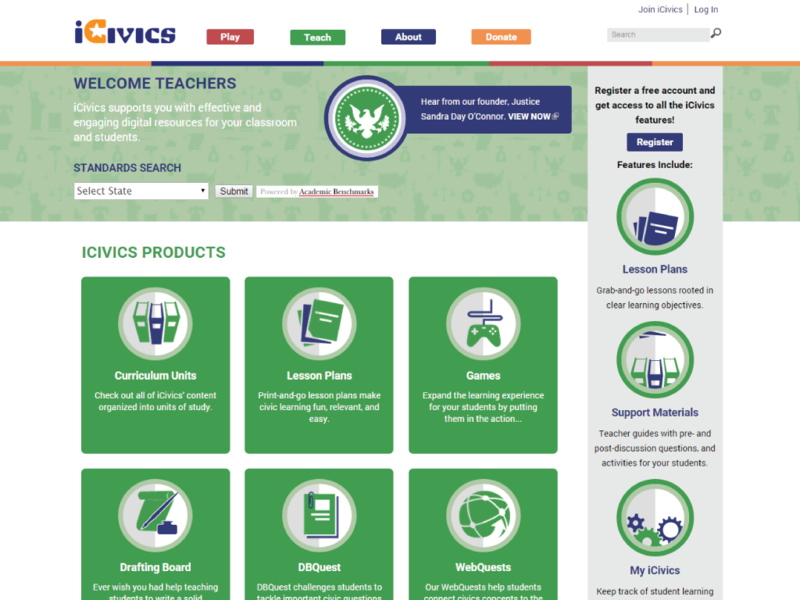 Carrie Ray-Hill is the Director of Content at iCivics, Inc. Carrie oversees the conceptualization and development of iCivics’ educational resources, with a particular concern for teacher usability. She is responsible for maintaining a consistent focus on iCivics’ educational mission. Carrie received her BS in Historical Studies and secondary teaching certification from Southern Illinois University at Edwardsville. 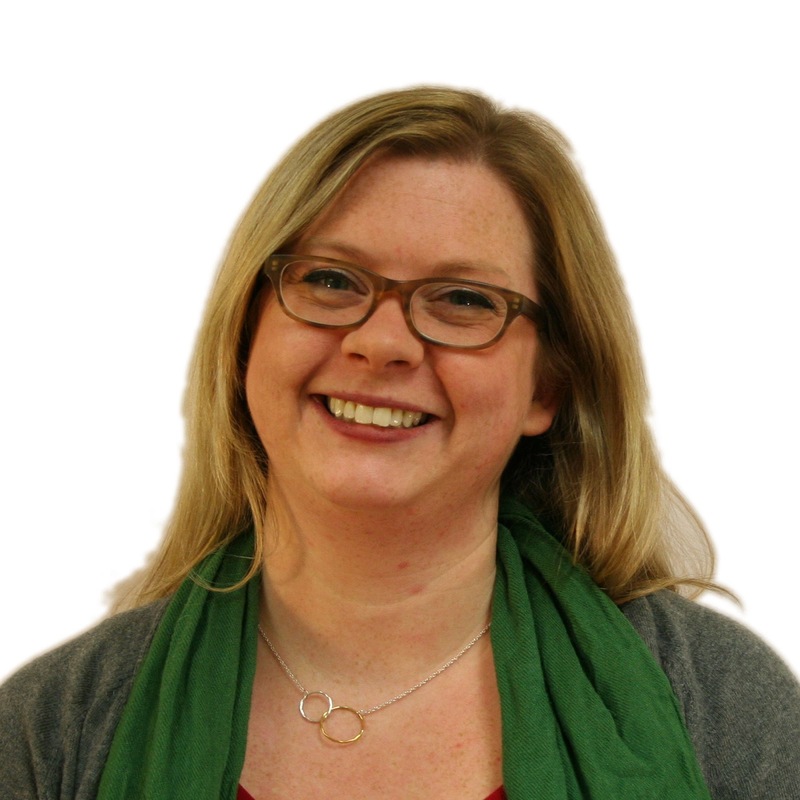 Prior to joining the iCivics team, Carrie taught middle school social studies and language arts in St. Louis and Washington, DC. Carrie lives in Madison, WI with her husband and cat, Earline. In addition to seeking out the finest of cheeses, she spends her spare time watching BBC quiz shows, making cookies, and killing zombies.